Five years ago in December we bought a house to restore and sell. Then we discovered we would soon be grand parents and we needed a bit bigger place. So our fixer-upper became our home. We moved in May 2011. It’s been four years and what a difference right? In these four years, we made the house habitable. It had been sitting partially touching the soil. We built a three car garage with apartment above. (Because of city regulations, we could not put it where the original car port was, we had to move it seventeen feet from the property line. So, yes, it takes up the entire back yard.) We planted a few trees. Our peach tree is conspicuously missing. It was right in front of the house about twelve feet from the curb. (Someone dug it up and took it in the middle of the night last week.) We added a fountain in the front yard, you can’t see it because it’s behind a tree. The upstairs french doors were removed and windows added instead. The lattice was removed as it served no purpose that we could see. The bottom porch’s curved pieces of wood were removed because they were rotted. Your eyes aren’t deceiving you, the wrap around bit of cedar shingles was replaced with roofing to give a more tailored look. 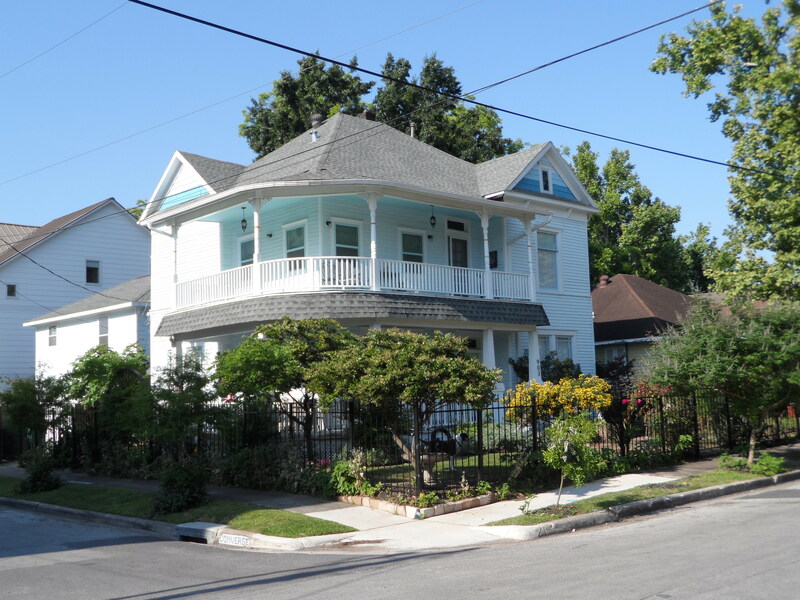 The house was built in 1910 by an insurance man who lived on LaSalle street. He built the house at about the time he married. 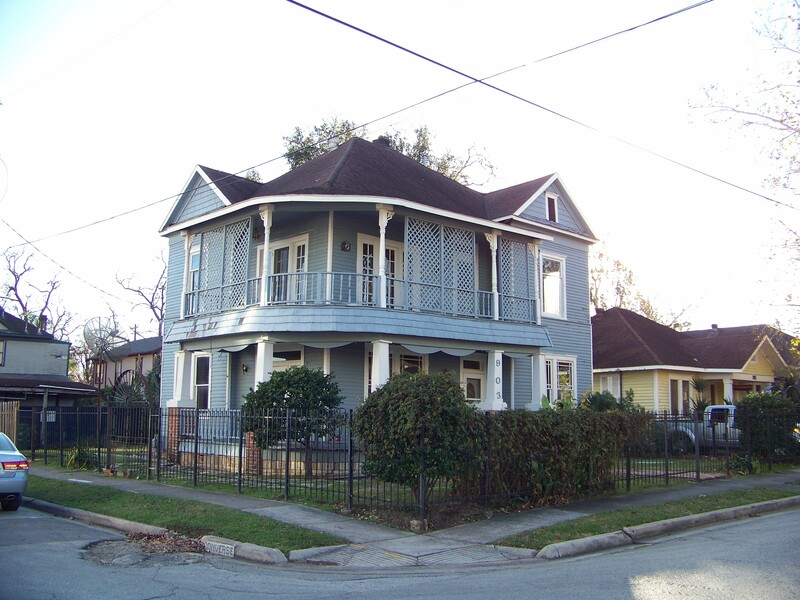 The porches have always been the way they are with the Victorian wrap-around with the slim supports and gingerbread on the balcony and the craftsman style supports on the lower porch. Nell lives a block away. She is 94 years old. She was born in the house she is living in. She used to play on our front porch when she was a little girl because her grandfather and the man who build our house were good friends and would sit and talk and tell stories on our front porch. It’s nice to know someone who has watched our house all these years. Our girl and her father. 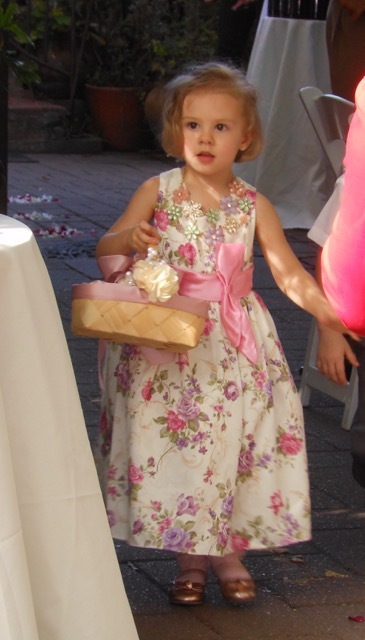 The prettiest flower girl, ever. The other big thing that has changed since we moved in is that our lovely daughter married. Our precious grand girl has a wonderful step-daddy. We are just pleased as the proverbial punch about this.